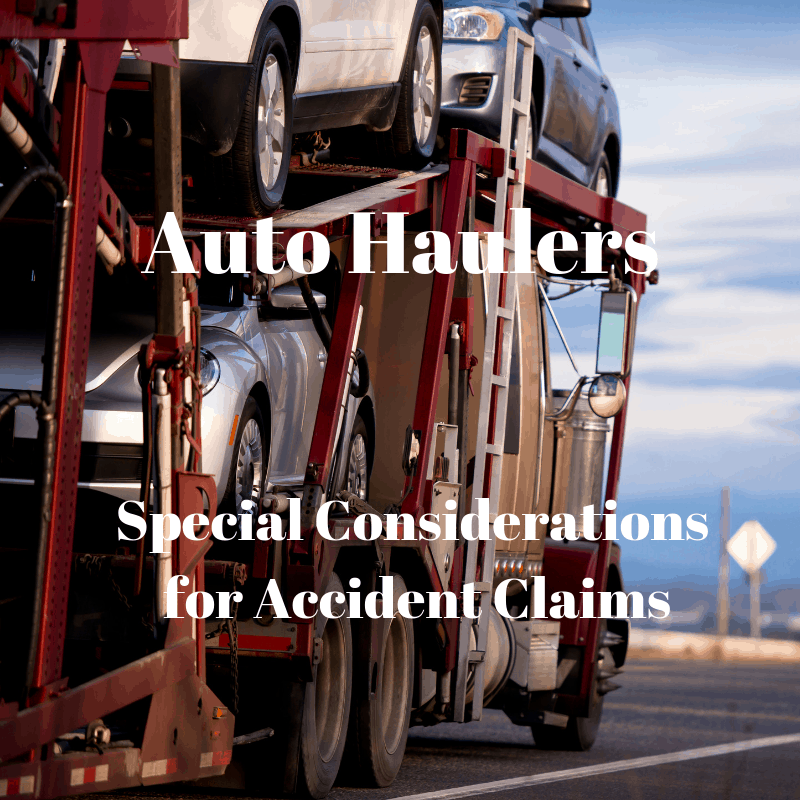 Auto Haulers: Special Considerations for Accident Claims | Eckert & Associates, P.A. A teenage driver is playing on his phone while speeding down the highway. He swerves into your auto hauling trailer as well as the expensive Mercedes loaded on the back. Not only do you have to get your trailer fixed, you have to handle the damage to the Mercedes. Auto haulers face this added stress. And none of this was your fault! Be prepared to have a claim filed against your insurance policy for the Mercedes’ damage. Whether or not you are ultimately responsible will depend on the law and your contract with the Mercedes owner. You may also have to file a claim on your insurance policy for your trailer’s damage if the teenager’s insurance company doesn’t act rapidly. In addition to the cost of repairs, be prepared for downtime and lost income while your trailer is being repaired: specialty welding and back-ordered parts may lengthen the process. After the accident, file a claim with the teen’s insurance company right away. Include your repairs, out of pocket expenses and lost income. While the teenage driver might not have much in the way of money to pay your claims, he may have adequate insurance to cover your losses and reimburse you. In certain states, you may also be able to pursue the owner of the car or the teen’s parents. Expect the teenage driver’s insurance company to question the amount of your losses. You might hear naive adjusters being surprised as to how much income auto haulers make and how much loss you had. Of course, wouldn’t it be wonderful if you could keep all of your gross profit? But that’s not the case. Your expenses may take the lion’s share of your gross income. Expenses keep coming in, whether or not you’re working. These same naive adjusters may try to deduct all of your expenses in order to calculate your net earnings. They then make an offer of pennies on the dollar. Our firm believes only a few variable expenses should be deducted, those costs you incur when you’re driving. Of course, the largest variable expense is the fuel which would have been spent if the truck was on the road. Don’t sit and wait for insurance companies to come to the rescue. You have a business to run and must get back on the road ASAP. Besides, you’re required to mitigate your losses. This means you have to try to reduce your large losses by taking action. Expect the adverse insurance adjuster to say you should have mitigated your losses by renting other equipment. While that adjuster may have no idea of the realities of renting heavy equipment, you do. As the claimant, you have to explain this to the adjuster. If you can’t rent auto hauling equipment to continue your work, you have to prove it. Emails from rental companies stating they don’t rent auto hauling equipment are helpful. Insurance companies work with documentation – you must prove your mitigation in writing. It also helps to have a non-biased expert on your side, someone knowledgeable in the transportation industry, who will state in writing it is impossible to rent similar equipment on a temporary basis. The more documentation you have from third party sources, the better. Sometimes the claim process can get bogged down through no fault of your own. The adverse adjuster may not have enough knowledge about the trucking industry or too little settlement authority. We can help! We will prepare a professional demand package and take over negotiations with the adverse adjuster. Our staff is knowledgeable and experienced helping auto haulers. Attorney Kelsea Eckert’s focus has been on the trucking industry for almost 30 years. Give us a call at 904-278-7688 or complete our online form for a free consultation.